You know that old saying the best laid plans of mice and men etc. Well my original intention was to do a daily update or at least post something every other day. However the dearth of internet access coupled with being kn*ck*red at the end of each day didn’t do much for that plan. So here I am already back in Abu Dhabi, but with a mountain of photos and an even larger mountain of video footage to slog through to find the best shots – not so dissimilar to the gold miners digging through tons of rock to find the odd ounce of gold – but more of that later. We had an uneventful flight on Etihad. The only bright spot was Cassandra, one of the stewardesses whose delightful countenance made a seven and a half hour flight almost a pleasure. 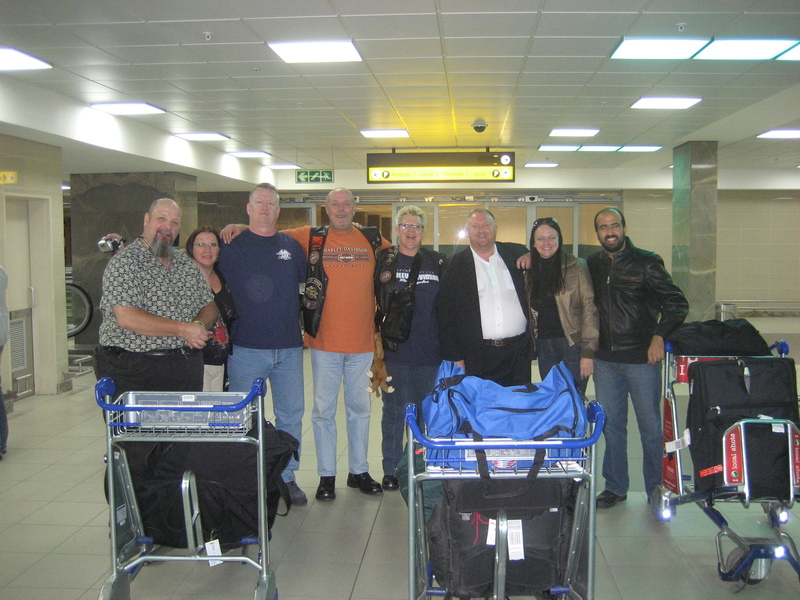 Here’s a photo of the South African Adventuresome Eight at the airport in Jo’berg. This entry was posted on October 13, 2008 at 1:54 pm and is filed under Uncategorized. You can follow any responses to this entry through the RSS 2.0 feed. You can leave a response, or trackback from your own site. No suprised it was uneventfull, the sight of all that muscel (relaxed) and the reflection from the fore heads would frighten any one. Glad you are returning safe and well, looking forward to catching up.